WASHINGTON — A senior advisor to Barack Obama is claiming that the popular craft chain Hobby Lobby and other businesses like it that oppose the abortion pill mandate in Obamacare are trying to ‘seize a controlling interest’ over women’s health care. Valerie Jarrett oversees the Offices of Public Engagement and Intergovernmental Affairs and chairs the White House Council on Women and Girls. On Tuesday, she posted a blog entitled A Woman’s Health Care Decisions Should Be in Her Own Hands, Not Her Boss’s on the White House website, which was also cross-posted by the Huffington Post. Jarrett began by stating that the Affordable Care Act (ACA), also known as Obamacare, served to ensure that a woman could make her own decisions without the input of her employer. Jarrett then specifically pointed to Hobby Lobby and asserted that the company did not want its employees to receive birth control benefits. However, according to attorneys for the craft chain, Hobby Lobby currently provides birth control coverage to its employees and takes no issue with contraceptives in general. It is only seeking to obtain an exemption from covering two contraceptives that its owners believe cause abortions: the morning-after and week-after pill. As previously reported, the United States Supreme Court announced on Tuesday that it had agreed to hear two cases: Sebelius v. Hobby Lobby Stores, Inc. and and Conestoga Wood Specialties Corp. v. Sebelius, both of which pertain to the abortion pill mandate in Obamacare. The Obama administration had filed an appeal to the court in September in an effort to force Hobby Lobby to comply with the mandate, asking the court to overturn a preliminary injunction that was granted to the company this past July. 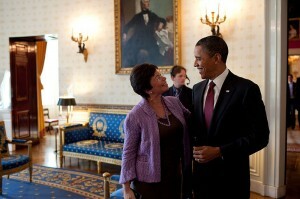 Jarrett wrote in her blog this week that she believes the court will side with the administration. However, the founder of Hobby Lobby is also optimistic, but for a different reason. He believes that the court will side with the rights of religious business owners. The case is expected to be decided by June of next year.